Happy Hour Fitness Friday! Every few weeks a 6-7pm class will pop-up on the schedule. Bring a Friend for Free to Workout before you Go Out! March 15th Zumba Dance Party with Susan & Eliana!! New Cycle Class! Spin Strong~Challenge your legs and heart with a climb-focused ride mixed with upper body strength work.Going at your own pace, but motivated by high energy music, your trainer and peers, you’ll experience a highly efficient, total body workout. A great blend of endurance and interval drills to optimize fat burn and muscle toning. Bring athletic shoes for off-bike training. The SeattleGYM proudly offers you the most complete selection of workout options in the city. We specialize in both dance-based and sports-based workouts. Some classes integrate both. The intensity of some cardio workouts may be depend on the ability to follow the movements. We hope this will help you choose the best place to start, and progress, in your lifetime of fitness. Every class is taught with the highest level of instruction, and progression so you can enjoy a result-focused workout. Try them all! MEDITATION Sunday Morning 8:00 am in the Queen Anne Barre Studio starts 1/13 & ends 2/24. Alex R. leads you through mindfulness for 30 minutes. Enjoy! Yoga blankets provided. From Les Mills USA, a not-to-miss muscle challenge! Great for all fitness levels because you determine your intensity. BodyPump™ is an energizing hour of group weight -training, using barbells, weight plates, and cutting edge music. Challenge your legs and heart with a climb-focused ride mixed with upper body strength work.Going at your own pace, but motivated by high energy music, your trainer and peers, you’ll experience a highly efficient, total body workout. A great blend of endurance and interval drills to optimize fat burn and muscle toning. Bring athletic shoes for off-bike training. This high-powered interval workout uses the best methods in athletic training for an unbelievable results-focused workout. Each member has an individual station of training tools to reach both aerobic and anaerobic zones. Motivating, technique-driven coaching will improve your shape, your performance and your commitment. This amazing, non-stop, never get bored workout has been scientifically proven to increase your metabolism, endurance and athletic performance, while also decreasing your body fat. Soon you will find yourself lost in the Tabata formula of performing 20 seconds of high intensity exercise followed by 10 seconds of rest. We will repeat this series 8 times and then move on to another set of exciting exercises. Open to all fitness levels. TBT™ XPRESS – 45 minute TBT™HiiT Workout!! TBT™ REPS focuses on more strength training using the barbell, dumbbells and plates. High- intensity cardio Tabata blocks and continuous strength training blocks are combined to torch the calories and chisel your muscles. No choreography, no dance & lots of sweat! Balletone is a barreless non-stop slow-burn workout for the non-dancer and dancer alike. The whole workout is done center floor and blends techniques from dance, pilates and fitness. You will leave feeling aligned, defined, balanced and strong! Great class to recover from HiiT and other intense training workouts. Bring a Yoga Mat. This “no-barre” workout is a flowing mix of ballet-inspired movement and fitness training for an energetic method of improving total-body strength, balance, stability, flexibility and posture. Standing to floor this popular hybrid workout will affect the way you stand and move every day. REACH combines a mix of training techniques, including aspects of Yoga and Pilates, for a unique challenge and release of energy all its own. Reach™ the Barre – New February 2019! A flowing, dynamic form of yoga, in which the breath acts as an anchor to the movement as you flow from one pose to the next. A wide range of yoga techniques such as sound (mantra), gestures (mudras), and visualization (bhavana); in addition to postures, breathing and meditation are practiced. Yoga Sutras, practical application to modern lifestyles and explanation of yoga symbols are emphasized. Sessions are spontaneously adapted to meet the needs, contex,t and experience level of the students attending. Vinyasa All Levels An all-levels Vinyasa Yoga class focused on unifying the breath, body and mind. Beginners can feel comfortable coming here to learn the basics, while experienced students will discover new ways to challenge and deepen their postures. All students will leave feeling centered, grounded and balanced. Class will start with dynamic and strengthening standing poses to build internal heat. The later portion of class will be comprised of longer holds (3-5 minutes) in passive postures to release tension in the connective tissues & increase circulation. This class is a mind-body workout, influenced and designed to link movements into a flowing series of exercises. This full body workout will develop strong trunk musculature, overall flexibility, and endurance. This Hatha-Yoga based slow flow class is designed for all ages and all levels. Participants will enjoy a class that combines meditation, breath work, and traditional yoga asana postures designed to encourage flexibility and build muscles strength. Pop Pilates is an incredible fusion of ab-chiseling and total body defining moves choreographed to your favorite Top 40 hits. This intense, mat-based workout challenges students to rhythmically flow from one exercise to the next, developing a rock solid core while leaving no muscle untouched. Les Mills BODYSTEP™ is an energizing step workout designed for all levels of experience. High-energy instructors teach simple movements using adjustable step height. Cardio blocks push fat burning systems into high gear followed by muscle conditioning to shape and tone your body. LesMills BODYCOMBAT™ is an empowering cardio workout where you are totally unleashed. This fiercely energetic program is inspired by martial arts and draws from a wide array of disciplines such as karate, boxing, taekwondo, tai chi and muay thai. Supported by driving music and powerful role model instructors, you strike, punch, kick and kata your way through calories to superior cardio fitness. The workout that combines the best of both of Step and HiLo! A 1/2 & 1/2 format that focuses completely on cardio for the entire hour. Great stretch at the end. If you want the benefits of both, join the mix. Get ready to dance-off the calories with this mixed-impact cardio-dance workout. The choreography is fun and will keep you moving, sweating and smiling. All levels welcome. Fridays include BEAM™ work (conditioning/stability/core). This is definitely a class that will take more than one try to perfect and well worth the effort. Join in the fun and challenge of this fast paced, “club style” cardio dance—this is a “hard-to-find in Seattle” mix of dance choreography and push to the max aerobics. This popular workout is designed for the member (new or long-time) who loves to dance, enjoys the challenge of learning, and can handle speed. Moves progress from basic steps into advanced and challenging combinations, full of directional movement, big moves, quick footwork, turns and jumps…a mental/physical journey. Zumba is an energetic hour that combines both cardio and body sculpting into one dynamic workout. Easy-to-follow dance steps, the class fuses Latin and international rhythms that tone and sculpt while burning fat. The party atmosphere will rejuvenate your heart, body and soul. A low-pact indoor cycle class that is able to accommodate the individual needs of the novice, as well as the competitive tri athlete! Increase your aerobic and anaerobic capacity, burn calories and jump-start your metabolism with this simulated outdoor-ride set to energizing music. Our bikes have SPD clip less pedals, as well as cages for athletic shoes. First-time attendees should arrive 10 minutes before class to be properly setup. 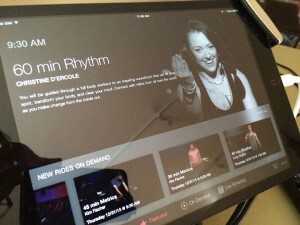 On demand Cycle classes selected from the Peloton menu. Another great way to get fit with your friends at The SeattleGYM! Available during non-cycle and GravtyGroup scheduled classes.